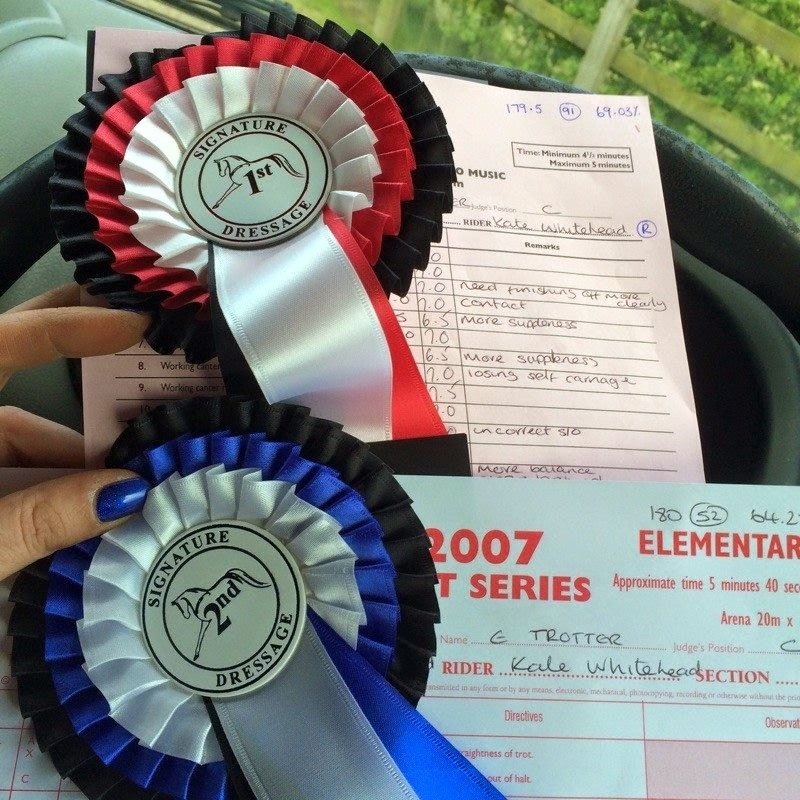 A huge well done to Kate and Rolie, who was here in 2012, who have been going from strength to strength over the last year or so. Last week they not only came first in their Elementary music but were also placed second in Elementary, with 69% and 64 % respectively. A brilliant result and we are so proud of them! Lad has been here 2 weeks, after arriving in remedial shoes. Time for an update as his feet are already changing. As you can see, on this foot the toe is already shorter and it will only be a couple more weeks at most before he has grown out the nail holes. His palmar hoof needs to strengthen and build up but he is landing better than when he arrived so that should happen naturally. ...and immediately out of shoes. The photo below is the same foot today. As you can see, lots of the old, weak hoof wall has chipped off, which is fine as it wasn't capable of loading anyway. In addition his frog is beginning to develop which is the first step towards a stronger palmar hoof. Again, these photos show him in and immediately out of shoes. The photo below is the same foot 2 weeks later and although it is similar if you compare the frog and digital cushion you can see the start of a strengthening hoof. This was his worse foot and its still got a long toe, as you can see. Its beginning to look less under-run though of course the back of his foot is still weak. ...and today, when his frog has developed tremendously. Its obvious from this angle that the long toe is not going to be an issue for long and also that he is developing much greater sole depth. Not an enormous change to show from the caudal shots but a hint of a tougher frog and digital cushion. More on Lad soon, of course. One thing you can guarantee when you have a hard-working barefoot horse is that it will get people talking - even arguing. 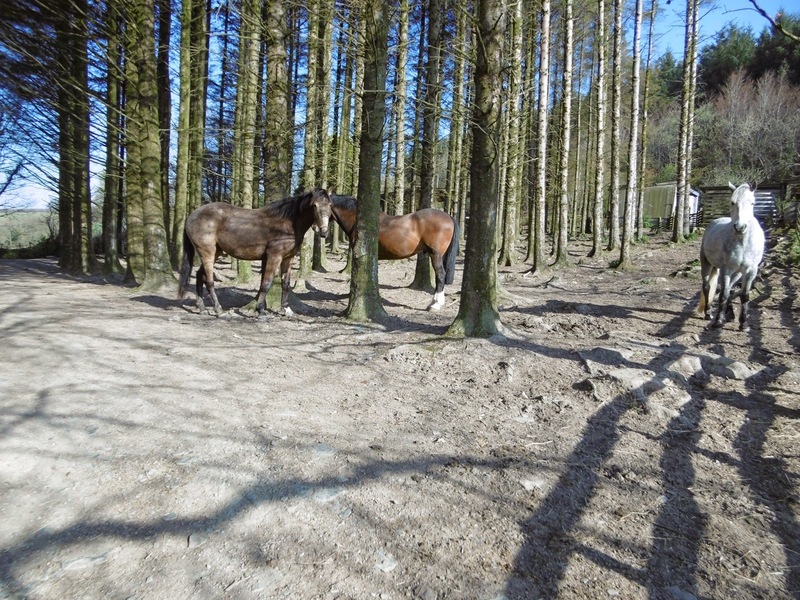 Other horse owners will make lots of assumptions about why you choose not to have shoes on your horse (inevitably, I suppose, I make assumptions in return about why anyone would choose to shoe a horse but I've not come up with any very satisfactory explanations although habit must play a large part). I blogged recently in my "Living in the Dark Ages" post about how strange it is that in the 21st century so many horses are still shod. The assumptions people most commonly voice are that either we do it to save money (nope) or we've just been lucky and somehow stumbled across horse after horse with fantastic feet purely by chance (nope). 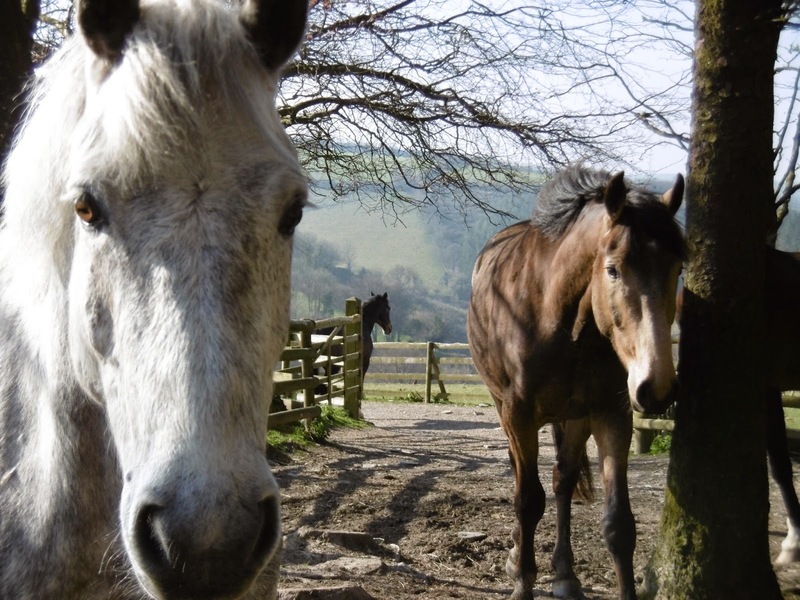 Yes, our horses do have fantastic, healthy feet but that's a product of the diet we feed them, the environment they live in and the work we do with them week in week out. Hoof health, like whole horse health, rarely happens by chance. So why not shoe? Quite simply because we want to keep those feet as healthy as possible. Interestingly, especially given how widespread the practice of shoeing is, there is very little evidence or research into what it does to a horse's foot. There is no research, as far as I am aware, comparing loading of of shod and bare hooves or measuring the comparative changes in them over time. Realistically this is difficult to achieve because owners of horses with healthy bare feet are unlikely to allow them to be shod and simply taking the shoes of a horse which has previously been shod (which is all that shod/bare studies have historically done) certainly doesn't give you a healthy bare foot as a starting point. So what can we know about shoes? Logically, as they are metal and secured with nails, they will have an effect on the temperature of the hoof. Metal is a better conductor than hoof wall so its logical to assume that (in most climates) a hoof will be colder when shod. In fact it was a farrier who first demonstrated this to me when he showed me something called a heat sink - a piece of aluminium designed to remove heat as efficiently as possible and which looks in essence a lot like a shoe. I posted about this in a blog back in 2009 but I still find it fascinating. The fact remains that shoes are an effective way of drawing heat rapidly and continuously out of hooves. Is that a good or a bad thing? I don't know but I for one prefer hooves which feel alive rather than dead. Another logical assumption which we can make is that shoes - particularly metal shoes - will have an effect on the internal hoof. Metal not only conducts heat but also shock. This is one area where there has been some research reported (Luca Bein, 1983) which confirms that a shod hoof receives significantly more concussion on a road than a barefoot horse. For me, that's another reason not to shoe - why increase the concussion on our horses' limbs and feet if we don't have to? The increase in concussion is not surprising. There is a double-whammy effect - not only does the metal as a material increase shock but also the fact that a shoe loads the horse's weight onto the hoof wall, making the frog and digital cushion unable to do their job. Over time, my experience is that an unloaded frog and digital cushion weaken and atrophy - a prime contributor to heel pain and lameness - another reason not to shoe. There's an additional effect which shoes may have, but where there is no equine research, so far as I am aware. Its something called stress shielding and I blogged about it in 2010 because I had a suspicion then that shoes could be affecting horses this way.
" If you replace or support a bone with a stiffer material, like metal, then the stiffer material becomes the primary load-bearing structure. This reduces load to the bone and it degenerates in response." It seems astonishing that there has been no veterinary investigation into shoes and this phenomenon. 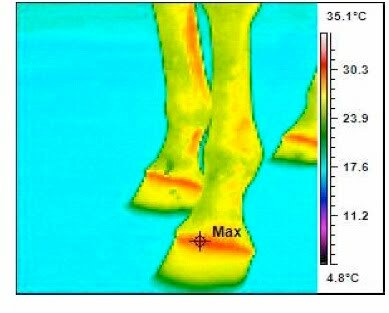 Bob Bowker published an article about coffin bone degeneration in shod horses but again we could do with comparative research which looks systematically at healthy, hard-working barefoot horses. Until then, coffin bone deterioration is another reason for me not to shoe my horses. There are other reasons too. A hoof is the magnifying-glass to the horse's health and fitness. 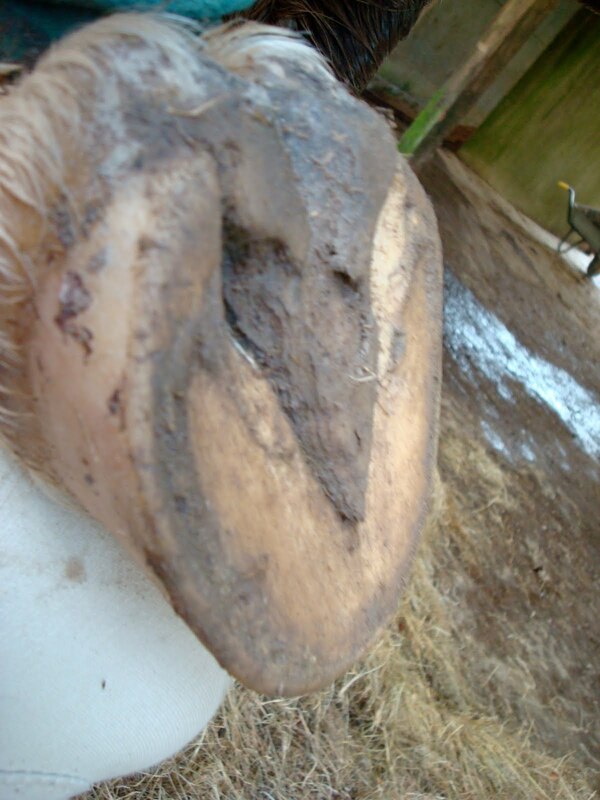 A healthy hoof is capable of incredible levels of hard work over every surface but you can't take short-cuts. Nutrition has to be right and the horse has to be moving correctly and loading balanced feet. The hooves themselves have to be brought to a level of fitness for the mileage and terrain you ask of them - unlike the "quick fix" of shoeing. We've had amazing weather this month - almost wall to wall sunshine. Its forecast to end later this week I think but for now we are making the most of it! New boy Lad arrived yesterday and he is another Devon resident, which means his owner Vikki will at least be able to come and see him a lot! Lad's vet and farrier have done their best to improve his lameness but its persisted so he has come here to see if rehab out of shoes can help him instead. There is already lots to like about his feet and his farrier has done a good job of improving his landing - which has gone from toe-first to flat or fractionally heel first on his better foot. There are some issues with his medio-lateral balance I suspect - if you look at the digital cushion there is a distinct difference between lateral and medial sides - but that should improve out of shoes. Lad has quite long toes in this shot but had gone 6 weeks since his last shoeing. These sole shots highlight how differently a hoof loads in a shoe as opposed to out of it. 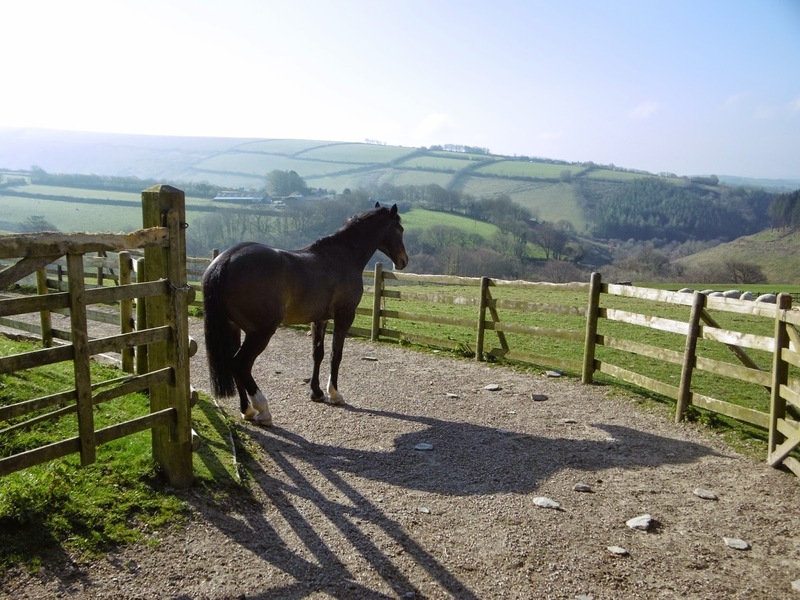 The swallows are arriving, the sun has been shining consistently since Easter, the fields are rolled, the muck is spread, the tractor has broken down only once - it can only mean one thing: Spring has decidedly sprung and there is LOTS to do! There is lots to blog as well but we've had an incredibly busy few days here. With a new horse arriving today there will be masses of photos tomorrow - back soon!